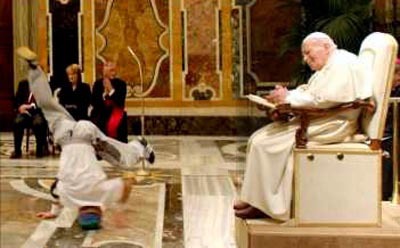 January 25, 2004 - In a spectacle at the Vatican John Paul II applauded Polish break-dancers who leaped, flipped, and spun their bodies to rock beats. "For this creative hard work I bless you from my heart," he said. A clear support for the most radical modern music and dance. Another step of liberalism in the customs of the Holy See.